Pilates ab workouts use controlled movements to create strong ab and back muscles leading to increased body flexibility and bone density. When the body’s middle muscles are toned and healthy, the rest of the body operates more efficiently. This is because the abdomen muscles are used to manage the rest of the body. People know that bone density increases with exercise, but do you know why? In a nutshell, some exercises create a small electrical charge in the bone which enables the body to more efficiently use bone-building nutrients like calcium. The charge attracts the minerals which promotes healthy bone growth. Pilates exercise for abs produces this result called the "Piezoelectric Effect". So you not only create a strong core muscle group, you are also building stronger bones. Check out the strong core muscles you will build from my Youtube video below! Though Pilates may sound like a miracle program…it’s not! There is nothing “fad’ about Pilates because you must learn how to properly perform the exercises to get the most results, and then must maintain the program in order to enjoy the improvements you experience. 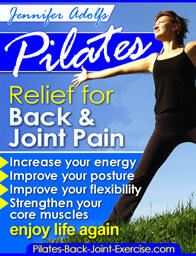 Get back pain relief today in my newly revised Pilates Ebook here. In fact, Pilates has been around since the 1920's, can you say that about aerobics, or weight training, or even yoga? It has just been kept secret except in certain communities, until now! In other words, Pilates great ab workouts require effort but the many wonderful results you can experience make all the effort worthwhile. The electrical charges in your body control things such as muscle contractions. There are many flows in the body as a matter of fact, including the blood flow, oxygen flows and others. The Pilates ab workouts use the principles of continuous flow of controlled movement to increase core muscle strength. The Pilates principles train the body to move efficiently and with the kind of effort which produces healthy results. You don’t just tone your muscles. You learn to use concentration, stability and resistance to create the ideal circumstances for core muscle group development. When your ab and back muscles are strong, you will experience all of the benefits listed earlier. In fact, a trim and strong abdomen has been proven to have a direct impact on your longevity. Fad exercise programs don’t work for long because they are impossible to maintain over a lifetime. The Pilates ab workouts let you learn how to develop your body’s strength by doing exercises you can complete over the years ahead. Pilates increases your body’s flexibility, health and longevity when coupled with a healthy diet and the maintenance of normal weight. When you learn how to complete the Pilates ab workouts the right way, you are adding another flow to your life. It is the flow of muscular power you get from continuous and controlled movements used to build strong core muscles.